Was architecture really a non-factor in Byzantine art? A new book debunks conventional wisdom. If architecture seems a minor player in the Western tradition, it appears even less significant in Byzantine art, an amorphously defined aggregation of objects dating from the third century to as late as the early nineteenth. The pieces are united by religious subject (Christianity), geographic origin (parts of eastern Europe, western Asia, and the Middle East), and a flat, non-realistic, and boldly delineated style. And painting after painting (after painting) suggests that, to Byzantine artists, architecture meant little. Flat registers of exterior walls and cartoonish, dark-lined images of church facades, domes, or towers seem to function largely to organize a composition, add a sense of shallow space, or create coloristic contrast (such as in the image above of a seventeenth-century Russian icon from the Novgorod School). Interior spaces almost never appear. Indeed, structures appear to be lowly tools in Byzantine artists’ project of vaunting the hallowed visages of the saints, prophets, and other divine Christian personages. Not so, argue Slobodan Ćurčić and Evangelina Hadjitryphonos in the magnificent new book Architecture as Icon: Perception and Representation of Architecture in Byzantine Art, which was the catalogue to an exhibition of the same name held at the Princeton University Art Museum earlier this year. The authors contend that, despite the many stylistic indicators suggesting architecture’s apparent insignificance in the Byzantine tradition, our Western eyes deceive us. Architecture is neither background nor framing device. Rather, the authors maintain, it “enjoyed a meaning and status equivalent to those of the saints depicted." Are Ćurčić and Hadjitryphonos correct? This Icon of Saint Spyridon depicts a portrait of the saint above the city of Corfu, where Spyridon “miraculously” stopped Venetian authorities from celebrating a Roman Catholic mass inside the church over which he presided. Here, the composition suggests equivalence between saint and city. Yet examples of compositions giving equal weight to buildings and figures are rare. Mostly, when one thinks of Byzantine icons, what comes to mind is saints, saints, saints. Much evidence substantiates the notion that, in the Byzantine conception of the divine, architecture served as far more than background. Constantine, after all, oversaw the most extensive building campaign undertaken in the West in generations. Fourth-century Byzantium, not just the eponymous Constantinople, was restless with construction. Basilicas, baptisteries, martyria, monasteries, pilgrimage sanctuaries, and other structures rose in Rome and cities throughout what is now Italy. They also sprang up along the Mediterranean coast and the many pilgrimage routes to the so-called Holy Land, Palestine. Architecture helped to first define and then perpetuate the new religion, and it continued to do so for hundreds of years. Along with the edifices grew an artistic tradition of depicting buildings, both real and imagined, in mosaics and paintings, models, reliquaries, cross bases (pictured above), plaques, manuscript illuminations, maps, tokens, and even souvenirs collected along pilgrimage routes. These representations of holy buildings and cities may have functioned as icons—or materializations of That Which Cannot Be Materialized—but they did so differently than did representations of saints. Images of buildings and cities (such as the pictured mosaic, likely from the Church of Qalat Kalota) offered an overlapping, diffuse, and sometimes contradictory field of metaphors. These varied over time and space, mostly without discernable pattern. A depiction of a church could represent the social space of communal religious assembly; God’s dwelling; the deity himself; the heavenly city; the cosmos (God’s creation, of course); the dwelling of the human soul or spirit (the divine within us); even the liminal space between the earthly and the divine. Along with these metaphors, there were the political functions of architecture in Byzantine art. Consider the famous mosaic in the Hagia Sophia in which Justinian holds a model of the Church and faces Constantine, who holds a model of Constantinople. Both are offering these models to the seated Virgin, with Jesus in her lap. The work seemingly confers divine sanction on these political leaders’ regimes by drawing direct lines between their imperial rule and their religious authority. Admittedly, from the modern standpoint, it is the apparent strangeness of these images that accounts for some of their appeal. Consider the remarkable icon of St. Simeon Stylites (left), the Christian ascetic who lived standing on a small platform atop a pillar near Aleppo for 40 years. Simeon stands nearly half as tall as the 15-meter column, which would make him more than 24 feet tall. Ćurčić and Hadjitryphonos argue that such distortions are often deliberate contributions to a work’s iconic nature. Consider the wonderful pink, green, and gold Icon of Saints Zosima and Savvatii (right), which flanks the remote monastery on Solovetsk Island in northern Russia. Zosima, the monastery's founder, and Savvatii, one of its earliest inhabitants, tower above the city’s outer walls, and even above the roofline of one of the basilicas within. Both saints are depicted frontally, but their city is shown from a diagonal bird’s eye perspective. In another spatial and perspectival shift, the seated figure of Jesus is positioned at the top and center of the painting, hands outstretched. He is set apart in a deep red, mandorla-like form (proportionally, far larger than either of the saints), blessing this northern outpost in the White Sea. Seen through Ćurčić and Hadjitryphonos’s eyes, the representation of the monastery enhances the sense that here—both in this icon and in this place—divinity resides. 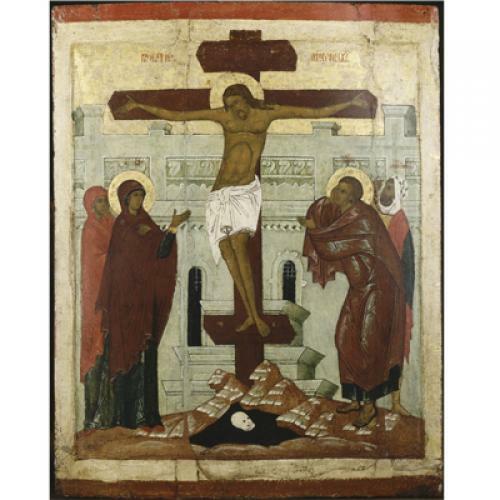 Such distortions in Byzantine art also reveal truths about how humans relate to their world—truths that are effaced in the realism of the Western tradition, but which appeal to the contemporary eye. People understand spatial relations from an egocentric point of view. The proportion of our head to our bodies may be approximately 1:8, but, in our lived experience, head and shoulders tower above the rest of our bodies, in the sense that they are much more important to our internal sense self than, for example, our torsos. What’s more, when we navigate the world, we use not a single, coherent, internally stored mental map but, rather, a patchwork of viewpoints, landmarks, and paths. Indeed, underlying the strange ways that figures relate to architecture in Byzantine art is a genuineness about lived experience. 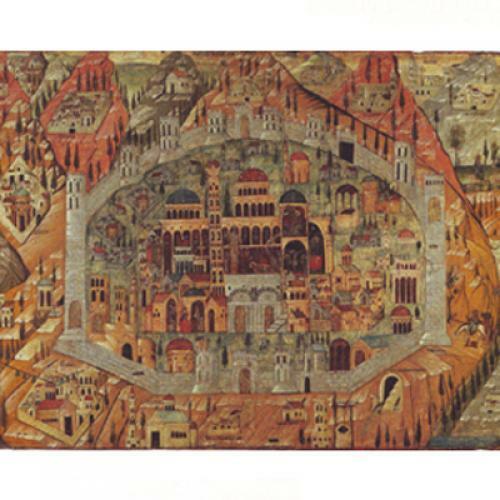 The pictorial distortions (such as those in the pictured mosaic from the Martyrion Basilica in the Church of the Holy Sepulchre in Jerusalem) resonate with the distortions humans actually use to navigate their world, to identify the important and distinguish it from the secondary, and to understand the enmeshed relationship of our inner world and the places and objects we use in the service of our days. Architecture as Icon is fascinating because it succeeds in two difficult and not necessarily complementary tasks. It compels us to step into the mind of the Byzantine artist, challenging us first to identify and then to shed assumptions about art, representation, and faith that we may not have even been aware we held. At the same time, the book invites us to analyze why this non-abstract art, with its many distortions, seems so fresh, so contemporary. These tensions are perhaps nowhere better expressed than in one of the book's most delightful paintings, which is of Jerusalem and arranged along the lines of descriptions in pilgrims' guidebooks. A beautiful composition of yellow and red ochres, watery blues and greens, this painting from the first half of the seventeenth century distorts scale, proportional relationships, and points of view into a captivating collage of perspectives. The overall image is a bird’s eye view showing the city’s hills and ancient walls. Various funerary monuments and religious structures, comically flattened, lay just inside the city walls. Centrally located and encircled by the walls of the old city is an enormous representation of the Church of the Anastasis—in section, with biblical scenes (Abraham’s sacrifice of Isaac, the Deposition) scattered on different floors. Here, in a single image, we have a map that supplies pilgrims with all the information needed to successfully navigate their spiritual journey through the Holy City. It is a painting that delineates the enmeshed relationship of spirituality and place, and an icon that instantiates divinity in earthly form. Even a twenty-first century non-believer can feel a reverent admiration for so many accomplishments, concentrated into one work of art. Sarah Williams Goldhagen is the architecture critic for The New Republic.